It is another Thankful Thursday at Stampin' Up! and the deal today is AMAZING! 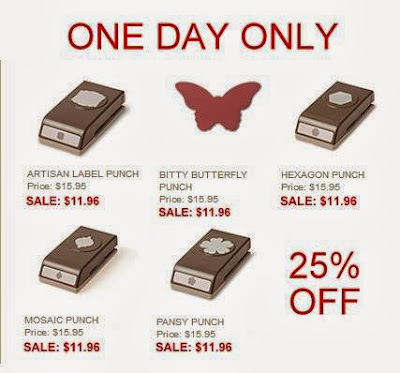 Below are 5 punches that you are able to get TODAY ONLY at a discounted rate. Here is a card a Happy Halloween card that I saw online from a fellow demonstrator Sandy M. and I had to CASE it. I am head over heels in love with the Witches Brew Washi Tape! I punched the witch from the Halloween Hello set with my 1 3/4 inch circle punch and sponged the edges with Pumpkin Pie. It kinds of reminds me of a full moon no? Don't forget Stampin' Up! also has a great weekly deal special going on now too!